The medical sector uses the properties of these elements for diagnostics as well as for treatments. 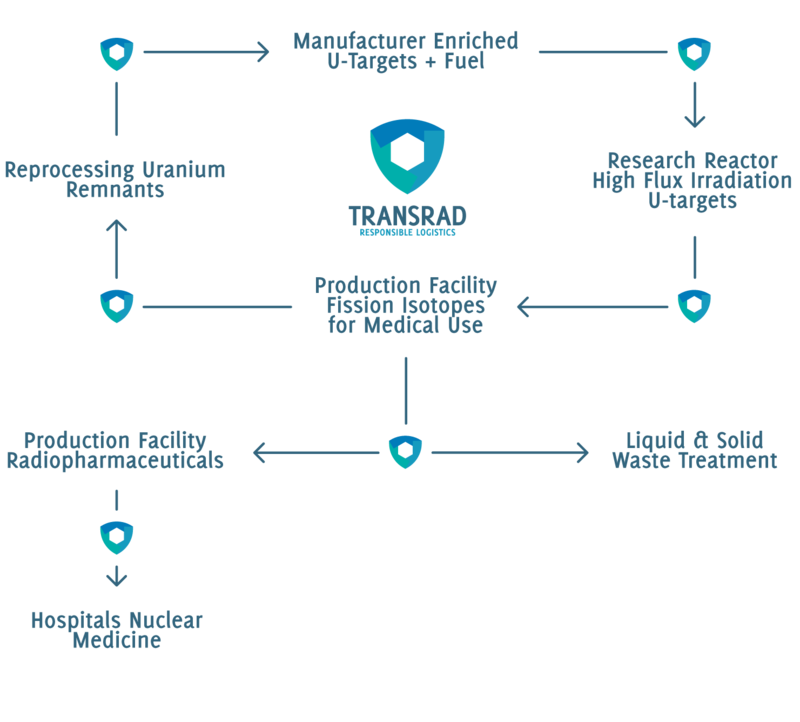 TRANSRAD is committed in every step of the supply chain, from raw material to the hospitals. We are active in radiochemistry and in radiopharmacy. The supply chain of Molybdenum-99 (Mo-99) is a good example of the complexity of our job. Molybdenum-99 (Mo-99) is the mother isotope of Technetium-99 (Tc-99). This radioisotope is used in close to 80% of the in-vivo diagnostics. It is primarily used for the investigation of the thyroid function but also for the detection of the presence of cancerous cells in the lungs, heart, liver, gall bladder and skeleton. The first step is to produce Uranium-235 (U-235) targets. These targets are transferred to reactors where they are irradiated. The fission reaction produces Mo-99. The irradiated targets containing U-235 and Mo-99 are then transported to a Mo-99 processing facility producing liquid Mo-99 (Production Facility Fission Isotopes). These liquid Mo-99 vials are then carried to a generator production facility (Production Facility Radiopharmaceuticals). The generators are directly shipped to the hospitals where the Tc-99m is injected into the patient. As the half-life of the Mo-99 is 66 hours and that the one of Tc-99m is 6 hours, distribution of these isotopes is a race against time. We also distribute globally a series of other isotopes used in radiopharmacy like iodine, yttrium, gallium, etc. Transporting radioactive material that is by nature decaying is like transporting a bucket of water with a hole in it and make sure you are quick enough to still deliver some water to your final customer.